My family’s Persian new year celebrations are some of my favorite memories from childhood (besides Thanksgiving -- nothing trumps Thanksgiving). 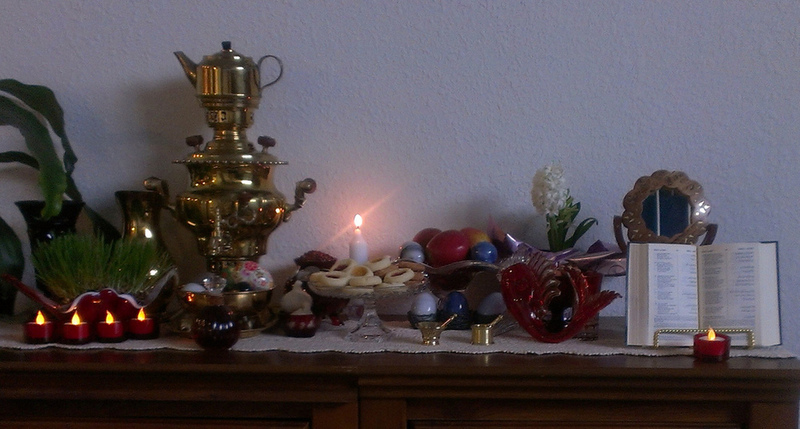 Honestly, I love any holiday that is drawn out for days on end, and Norouz always seems like it lasts for weeks, probably because of the surrounding holidays. Right before the new year, Iranians celebrate Chaharshanbe Suri, which Wikipedia is telling me literally translates to Wednesday Red. Chaharshanbe Suri is a fire festival -- on the evening of the last Tuesday before the new year, Iranians light bonfires and jump over them. This is supposed to be a purification rite. The fire is meant to burn away all of your sickness and problems, leaving only warmth in its wake. My family would always have a huge party, the kind of party that everyone in our lives was invited to (including teachers and principals - seeing them out of context was always equal parts fascinating and horrifying to me, but it did give me some bragging rights on the playground). My mother would go all out cooking for these parties. I remember standing in the kitchen with her for hours, rolling dolmas and frying zulbia (syrupy Persian fritters) together. I loved the ritual and care appetizers took, it was so different from the rote cooking of our daily lives. It felt special. My favorite part of the night was always when we would jump over the fire. When I was very young, my father always helped swing me over the fire mid-jump, to make sure I didn’t fall in - I was a very cautious child. My parents must have snapped dozens of photos of those jumps, and every year my sisters and I have such a look of excitement on our faces - how daring we felt! 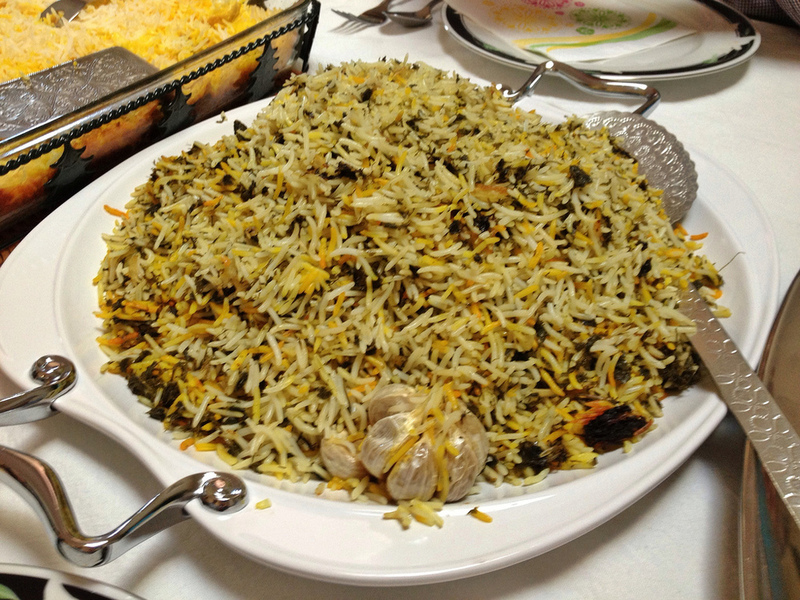 Norouz itself, the actual New Year, is always about the food. 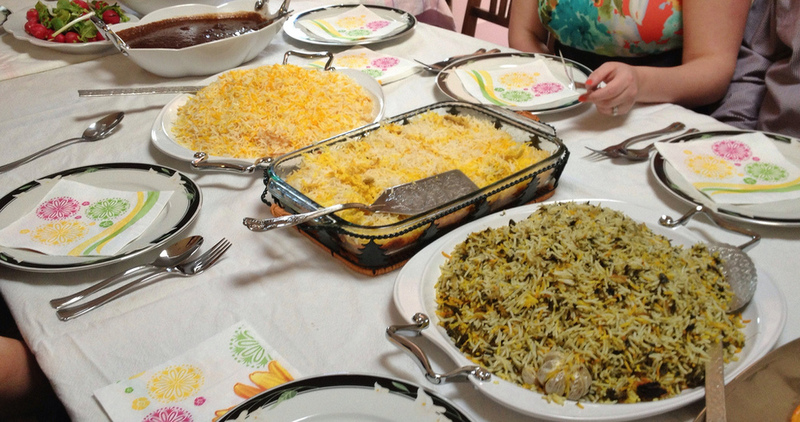 Every Iranian holiday is (to me anyway). My aunt always throws this party -- if you want Iranian food done right you go to my aunt. She is the one who perfected my rice cooking technique and she always makes outstanding food for Norouz. 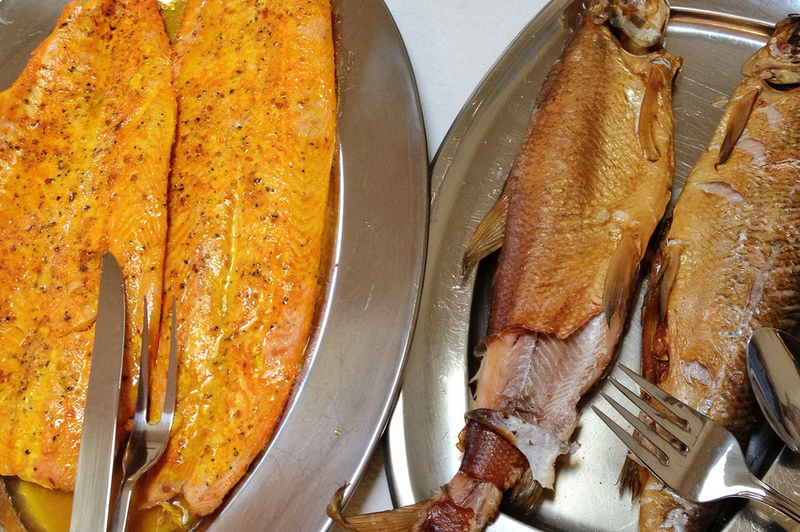 The traditional meal is sabzi poloh mahi, which translates to green rice with fish. The rice is cooked with green herbs, mostly parsley, dill, chives and fenugreek, and is served alongside a beautiful piece of fish. What a wonderful way to welcome spring into your home! The decor of the new year is also key. Iranians create a haft sin for Norouz, a table display that contains 7 (or more) items that start with the letter “s” (in Farsi). These include green sprouts (sabzi), garlic (seer), apples (sib), vinegar (serkeh), hyacinth (sombol), sumac berries (sumaq), and coins (sekkeh). Other items are frequently present, such as goldfish, mirrors, candles or books of poetry. Finally, thirteen days into the new year Iranians celebrate Sizdeh Bedar, an outdoor day of celebration. I’ve never been to Iran during the spring, but apparently on Sizdeh Bedar the cities empty, with all of the people going outside to enjoy the forests and lakes in the countryside -- Iranians love a good picnic. The green sprouts that have been grown for the haft sin table are thrown away at the end of this day’s festivities, and with it a family’s pain and ill-fates from the coming year are supposedly thrown out as well. 2013’s Chaharshanbe Suri and Norouz have already come and gone, but you can join in on the festivities by celebrating Sizdeh Bedar this Sunday, March 31st. Go outside, breathe in some fresh air and welcome the coming year - Persian style!